In terms of its style, its heraldry, and details of its text, this volume is a member of a close-knit group of manuscripts made for members of the Bohun family, who were earls of Hereford, Essex, and Northampton for most of the 13th and 14th centuries. It is possible that it was made at the Bohun family castle at Pleshey, a few miles north-west of Chelmsford; John de Teye (probably from Great or Little Tay, a few miles west of Colchester) is recorded as having worked as the family's illuminator there. 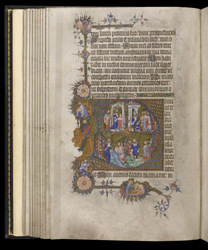 The initial contains four scenes: Joab making David cease mourning; David in the gate; Shimei falling down before David; and David sparing Shimei (II Samuel 19:5-8, 17-23). To the left of these scenes a French king is presenting his sword to an English king (Edward III) astride a lion; this probably symbolises the capture of Jean le Bon at the Battle of Poitiers in 1356. In the lower border two women fight over a chest of money.